Julie here! I’m so excited to introduce you to my friend, Laura Hodges Poole. You might remember a few months ago I interviewed Laura Hilton from the critique group we belong to. Laura Poole is also in that group. Laura has a new release, and I loved it from the first chapter I critiqued. 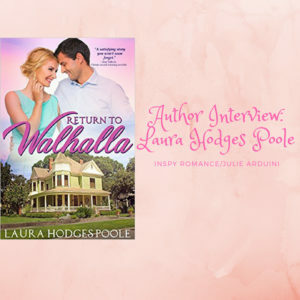 I interviewed her for Inspy Romance, and I believe you’re going to love getting to know her and want to read Return to Walhalla. Before meeting Laura, I also wanted to let you know today and tomorrow two of my eBooks are free on Amazon. Engaged is my latest contemporary romance and the final book in my Surrendering Time series. It can be a stand alone. You’re Beautiful has a romance thread and was co authored by our teen daughter, Hannah. Don’t forget to check them out after reading Laura’s interview! Please tell us about yourself. I’m a Christian writer with a heart for hurting people. Life is difficult, whether you’re a Christian or not. I’ve dealt with a lot of heartache and death in my life, particularly that of my sister and, more recently, my daughter. I’ve written a blog for the last six years, A Word of Encouragement, and a devotional, While I’m Waiting, because people desperately need encouragement in this broken world. They need to be reassured that God is present in the waiting for answered prayers. Even through the toughest trial on earth, God will be there with you. He’ll also be there in the daily grind of life, in what might seem insignificant to someone else. I also love to hike in the mountains; actually I love just being outdoors in nature. I enjoy playing the piano and taught both of my children to play some. I live in the upstate of South Carolina, only a short drive from the mountains and the small town of Walhalla where my current book is set. How long have you been writing? What was it that gave you the motivation to pursue publication? I’ve been writing all my life, though seriously toward publication for the last twelve years. In 2005, I turned 40 and my sister had passed away two weeks before, so that milestone birthday didn’t really sink in. I drifted through my grief, not knowing what to do with my future. Then I picked up the newspaper one day and saw a mystery serial contest already in progress. One installment a month was published, and they were halfway through for the year. I thought, “I can do this.” So I submitted a chapter and was totally surprised when the features editor called me and told me I’d won. I had presence of mind to ask if I could enter again. I won the next five installments. It gave me practice writing something longer than a short story along with character and plot development. This small success was the catalyst that pushed me to write seriously toward publication. Tell us about your new release. Return to Walhalla is a Christian romance, Penny and Tommy’s love story. But ultimately, it’s a story of brokenness, redemption, and love—the three basic things of life, right? It’s also about complex family relationships and God’s grace covering even the biggest mistakes of your life. Walhalla is a real town in South Carolina, about an hour from where I live. The book provides an authentic experience of Southern small-town living and hopefully, the descriptions of the upstate of South Carolina, nestled in the foothills of the Blue Ridge Mountains, do it justice. What inspired you to write this? The first time I rode through Walhalla was on the way to one of South Carolina’s numerous waterfalls, Isaqueena Falls, although in Return to Walhalla, another well-known state park, Twin Falls, is featured. The beauty and charm of Walhalla caught my attention on this excursion, so I returned another day to sightsee. I noticed quilt blocks on various businesses around town. I stopped into the Oconee Heritage Center Museum, where I learned about the Upstate Heritage Quilt Trail, which commemorates the quilting heritage of the community. Each quilt block had a story behind it, which intrigued me. One day, as I thought about more about the town, the title Return to Walhalla popped into my mind, along with two characters, Penny Ruskin and Tommy McAllister. I knew I had my next story. I followed the story where Penny and Tommy led me, through past heartache, forgiveness, and redemption, along with the humor of Southern family and church get-togethers. Secondary characters like one of the church ladies, Miss Betty, and teenager Emma Johnson play important roles in Penny’s life, and of course, the quest to keep her in Walhalla. Naturally, I also included a quilting storyline. Did you face any challenges writing this book? Not really. The challenging part was after I signed the contract, which I did four days before my daughter passed away unexpectedly. There was a year and a half publishing process with edits and deadlines to meet when I often didn’t feel like sitting at the computer. I definitely felt God’s hand on me in the process. What is your hope that readers take away from it? Return to Walhalla is as much about facing life’s tough challenges with God’s help as it is about romantic love. No matter what we go through, we can count on God’s comfort and peace to see us through. You’re never so far from God that turning back isn’t possible. I hope readers are both entertained and inspired as they read Penny’s story of returning to Walhalla. What are you working on now? I’ve started on the next book in the series after Return to Walhalla, which will be Emma’s story. I’m also revising an earlier Christian romance manuscript for my agent to shop. What is something most readers would not know about you? I love to cross stitch and play the piano when I have time. I also love to cook. Do you have any questions for the readers? What inspires you most about Christian fiction—romance, in particular? 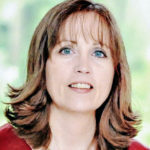 Laura Hodges Poole is a freelance writer with dozens of articles, devotions, and short stories in publication. Her books are available on Amazon. Laura is the 2016 ACWC Badge of Honor winner, a 2014 ACFW Genesis semi-finalist, and a 2012 RWA Emily finalist. As an editor, she enjoys mentoring and helping other writers polish their work. Laura is also a non-fiction ghostwriter/collaborator. Her passion is encouraging others in their Christian walk through her blog, “A Word of Encouragement.” When she’s not writing, you might find her hiking, playing the piano, or being crafty. A mother of two, Laura lives in South Carolina with her husband and son. When financier Penny Ruskin returns to Walhalla, South Carolina, she has one purpose—to settle her grandmother’s estate and sell the Victorian house she grew up in. Not an easy task with the downturned economy. What she doesn’t count on are all the roadblocks thrown in her path. Hi Julie and welcome Laura! The title of your story had me hooked and I had to do some research. With my German relatives I visited The German Bavarian Walhalla in 1984. The Walhalla is a hall of fame that honors laudable and distinguished people in German history – “politicians, sovereigns, scientists and artists of the German tongue.” Set in the Bavarian Alps it was impressive and very educational. So I wondered if Walhalla, South Carolina was settled by Germans, since the Blue Ridge Mountains have similar terrain. And I was correct, settled in 1850 about 20 years after the German Wallhalla was being built. There are five US towns / villages named Walhalla, including a Villingen of about 1500 in near Ludington, Michigan. In addition Penny is a family nickname (my son’s) and our 16 year old Sheltie’s name. My mom (RIP) loved to quilt and do several of my friends. Question: Did you add the German heritage to your book? Especially the celebration of Oktoberfest? Best wishes and Happy Writing! Adding book to my wish list. That’s fascinating! I believe you’ll love Return to Walhalla. Laura is a fantastic author. Thanks for that wonderful information, Renate. I didn’t add the German aspect or Oktoberfest to the book. There are many other things in the book, though, like quilting which is an important part of Walhalla’s heritage, and the waterfalls, which is a favorite in the upstate of SC. Hope you enjoy the book! Before reading Return to Walhalla, I had never heard of such a place. Your Walhalla makes me want to go right now! Hi Wemble! I thought Walhalla was an unusual name, but I’m learning there are places all over the globe! That’s cool you have one in Australia, too. Thanks for sharing that. God bless. Welcome Laura. Interesting interview and thanks for sharing some of your personal experience and pain you went through to get to where you are now. I love the title or your book and I will be sure to have it as part of my TBR list. Laura is a model of God’s grace. I can’t begin to understand her loss, and yet she has a beautiful book she’s written and is marketing in the midst of it. I believe everyone will love her work (and her!) as much as I do. Thanks, Colleen. I appreciate your kind words. I hope you enjoy Return to Walhalla. God bless. Hi Laura and Julie! I too have critiqued with Laura and gotten to know her through writers’ conferences. She is the sweetest person, and my heart has ached for her with all she’s been through. She has been an inspiration with her faith. I’m happy to see her here at Inspy. I don’t need to been in the drawing, just wanted to say hello. Thank you, Janet! She truly is an inspiration. Thank you, Janet and Julie. I appreciate you both so much! Thank you for sharing. The book sounds interesting. I love the inspy romance authors. Lord continue to give comfort and grace. Thank you so much, Diana. I’m glad you enjoyed the interview! Thank you for the interesting interview. I’m so sorry about the loss of your daughter. Look forward to reading this book. Blessings! Thank you, Lucy. I appreciate your kind words and condolences. I hope you enjoy the book! God bless. Miss Mable is 95 years old. I will quote what she said to me about CF Romance books. She loves to read them because this is the “only” way she will get any romance at all. I love that quote, Janet! Thanks for stopping by and sharing. Hi Laura. I often wonder how people who don’t know Jesus make it through the tragedies of this world. I can’t imagine trying to make it on my own and am so glad I don’t have to. I agree, Shannon. I wonder how I would’ve gotten through without my faith. Thanks for the post! I have the book on my Kindle…..on my massively tumbling TBR pile…. Thanks for getting the book! I hope you enjoy it!